And finally Steve also reset all of the initial conditions after solving the model a coupl of times for 1000ms. Abstract: We develop a point model of the cardiac myofilament (MF) to simulate wide variety of experimental muscle characterizations including Force-Ca relations and twitches under isometric, isosarcometric, isotonic and auxotonic conditions. Complex MF behaviors are difficult to model because spatial interactions cannot be directly implemented as ordinary differential equations (ODEs). We therefore allow phenomenological approximations with careful consideration to the relationships with the underlying biophysical mechanisms. We describe new formulations that avoid mean-field approximations found in most existing MF models. To increase the scope and applicability of the model, we include length- and temperature-dependent effects that play important roles in MF response. We have also included a representation of passive restoring forces to simulate isolated cell shortening protocols. Possessing both computational efficiency and the ability to simulate a wide variety of muscle responses, the MF representation is well-suited for coupling to existing cardiac cell models of electrophysiology and Ca-handling mechanisms. To illustrate this suitability, the MF model is coupled to the Chicago rabbit cardiomyocyte model. The combined model generates realistic appearing action potentials, intracellular Ca transients, and cell shortening signals. 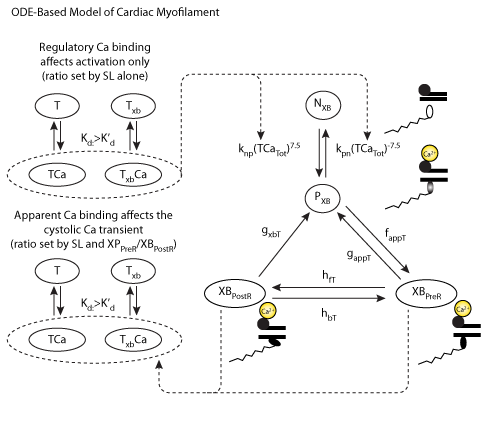 The combined model also demonstrates that the feedback effects of force on Ca binding to troponin can modify the cystolic Ca transient. Derived from workspace Rice, Wang, Bers, Detombe, 2008 at changeset d39b62d37aae.